Anmei Zhi ‘20 embodies entrepreneurial spirit. Anmei discovered her love for entrepreneurship during her girl scout years selling their famous cookies, but it wasn’t until she came to Smith that she was able to put her entrepreneurial mindset to work. “I have always had this entrepreneurial spirit but I have never had an outlet for it until I came to Smith and got introduced to the Conway Center,” Anmei reflects. As an economics major and studio art minor, entrepreneurship proved to be “a really good way to combine creativity and learning and a fun way of problem-solving,” Anmei says. During her first year, Anmei decided to participate in the 2017 Draper Competition with a team of two fellow Smithies whom she had met in an economics class and bonded with over the Innovative Strategies Workshop Series hosted by the Conway Center. Anmei (center) with her teammates at the 2018 Draper Competition. Her business idea for the Draper Competition was an “app-based bike sharing platform called Rebike that allows students to rent out their bikes to fellow students who don’t have bikes on campus.” The idea for Rebike was inspired by a shared pain point: having travelled a long way to come to Northampton, Anmei and her teammates were not able to bring their bikes to campus. “One night, we were on our way to our favorite donut shop in town. When we passed by the campus center we saw a bike in the bike rack that hadn’t been moved in weeks,” Anmei describes. “It was at that moment that we realized that a bike sharing platform could actually be a profitable business.” The idea for Rebike did indeed turn out to be a profitable idea as the team placed third in the 2018 Draper Competition, receiving $10,000 in seed funding. Preparing for the competition also helped Anmei gain the technical business skills and practical training that she was missing in her academic curriculum. “In my economics classes I was getting exposed to a lot of theories, but I had no way to apply them and ground them in real-life experiences. Participating in Draper was a creative outlet for me to try these theories out on my own and get a more hands on experience,” she says. 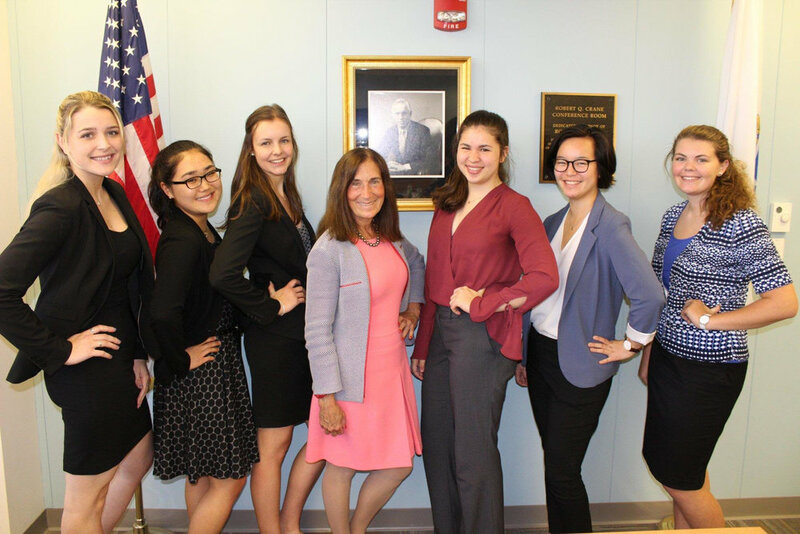 Anmei (second from right) and her fellow 2018 Women in Finance Fellows. Anmei had the opportunity to put her newly acquired technical skills to work during her summer 2018 fellowship at the Massachusetts State Treasury. The 10-week Women in Finance Fellowship program prepares undergraduate women for careers in finance through workshops and practical training in financial literacy. During the program, she learned how to use financial tools like the Bloomberg Terminal and improved skills like interviewing and negotiating a salary. For Anmei, the program was a great stepping stone to what she aspires to do: work on Wall Street. Anmei found the exposure to the finance world itself the most helpful. “Just sitting through meetings allowed me to familiarize myself with the language of finance, which is a language of it own. Using financial terms and getting comfortable with finance jargon really helped me get better in my interviews.” In addition to the fellowship, Anmei gained exposure to the world of Wall Street through co-curricular activities on campus, like the Wall Street Prep Program, the Smith-Tuck Fast Track to Business and countless interview prep workshops. Anmei even found that her involvement in entrepreneurial activities on campus helped her become better prepared for a career in finance. “Just having entrepreneurial spirit really helps you drive whatever you do. Starting a business teaches you so much — either technically or just about yourself — and it instills this understanding of how important it is to know how to work toward a goal,” Anmei reflects. All of Anmei’s hard work paid off and she will be an investment banking intern at Goldman Sachs in New York City in the summer of 2019. Anmei (left) in front of the Massachusettse Treasury. As someone who has been through the stressful recruiting process, Anmei has found out that there is a lot of pressure for undergraduate students who want to work on Wall Street to get internships as early as possible. However, “what you should be looking for in a sophomore internship is just getting experiences. It doesn't have to be this amazing experience, you just have to have learned from it and take that with you moving forward,” Anmei advises. She also encourages students to really take advantage of learning opportunities on campus. “There are so many resources at Smith and the great thing is that Smith makes these opportunities really accessible with scholarships and financial support,” says Anmei. She hopes more Smithies will seek out and tap into all the financial literacy opportunities that Smith has to offer. Anmei also encourages students to seek out the help and mentorship of Smith alumnae who have had careers on Wall Street and can provide helpful advice and insight into the finance world. 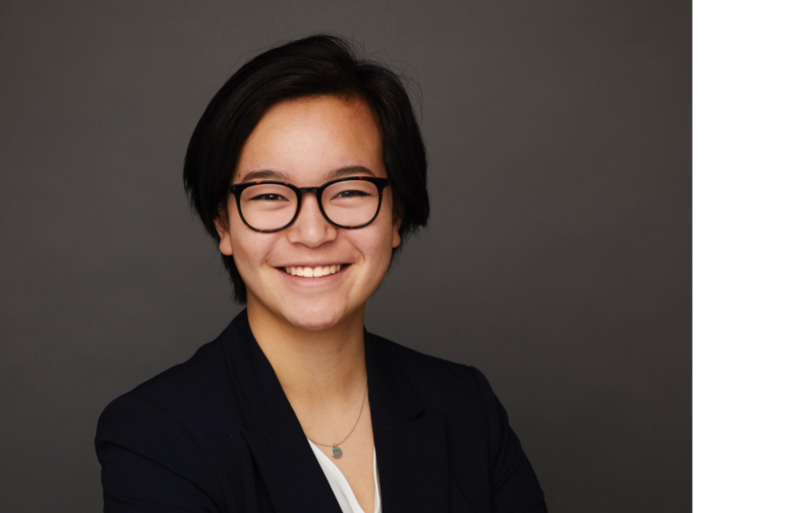 Anmei Zhi ‘20 is an economics major and studio art minor from San Diego, CA, who is passionate about entrepreneurship, business and the finance world. She is currently spending her Junior Year abroad at the London School of Economics and traveling across Europe. Anmei and her team have won over $15,000 in prize money at business plan competitions on and off campus with their venture Rebike.